Italy based ITACAe has agreed to market and support Nexus, iChrome’s multi-disciplinary and multi-objective process integration and optimization solution. Nexus will enrich and complete ITACAe software portfolio offering an advanced and user-friendly multi-disciplinary design process automation and optimization solution at affordable price to their high technologically minded customers. We are proud to reveal our User Blog. We hope you will find it to be a useful place to share information on how to use or products as well as tips and tricks in the field of CAE driven design. You can visit the Blog here. 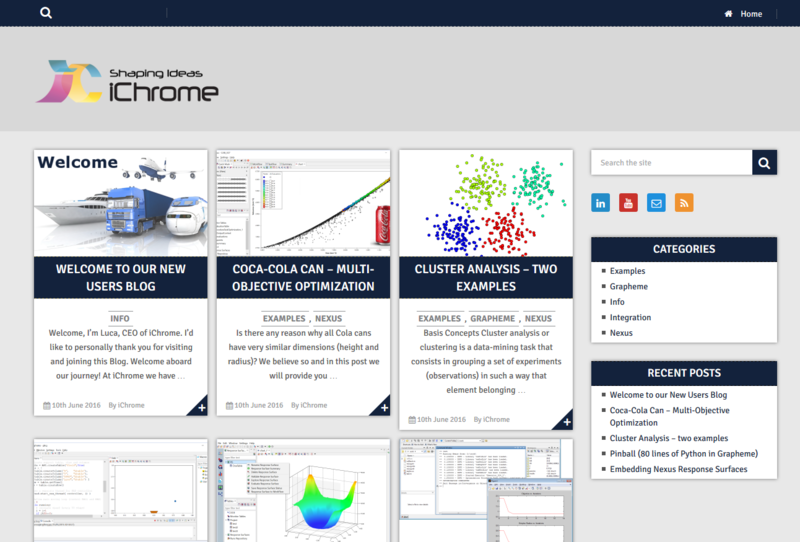 In the pursuit of delivering cutting-edge technologies to Small Enterprise, iChrome is proud to announce new light versions of Nexus for Ansys Workbench and Nastran Desktop (Femap). These light versions have been specifically designed to help SME firms to unlock their resources and to innovate their product levering virtual prototyping and numerical optimisation. At iChrome, we are proud to announce a release of Nexus: Nexus v.2.8. Users can now write and execute scripts to create, import, combine and operate with table data and charts. Post-processing and editing results have never been so easy and user friendly. CAE Viewer v.1.1 has now been released: twice faster, twice lighter! We are proud to announce a new release of the CAE Viewer. Our free CAE visualization tool now includes STL model support and important performance improvements which make it twice faster and much lighter when importing models and results. Copyright © 2018 – iChrome Ltd. iChrome, Nexus, Shaper, Grapheme and related logos are trademarks of iChrome Ltd. All rights reserved. Any other trademark herein referred to is property of its respective trademark holder and iChrome does not claim any right on it. You can view iChrome’s Personal Data Protection Policy here.